When work started on the new development on Papirøen / Paper Island at the centre of the harbour opposite the national theatre and the warehouses there were demolished then Cobe - the planning and architecture studio of Dan Stubbergaard - had to move out and they moved to Nordhavn to former warehouses on Orientkaj. This is more than appropriate for Cobe produced the masterplan for this major area of redevelopment and, of course, designed the restoration of a concrete silo here that is now apartments and slated to become possibly the iconic building of contemporary Copenhagen. At the old site, behind the popular food halls, they had a fairly open house and here, to encourage visitors, as the new community out here grows, they have opened a café at the entrance from the quay. 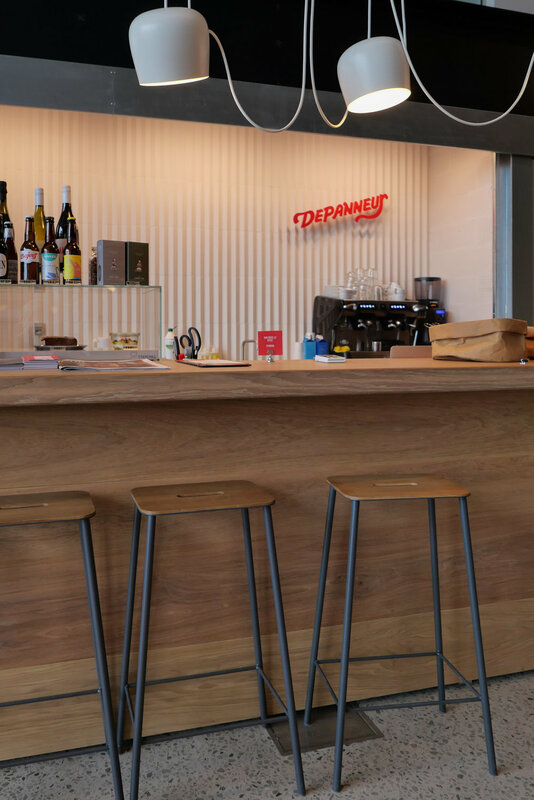 In partnership with Depanneur, they serve good coffee, basic but good rolls and cakes and beer and so on. 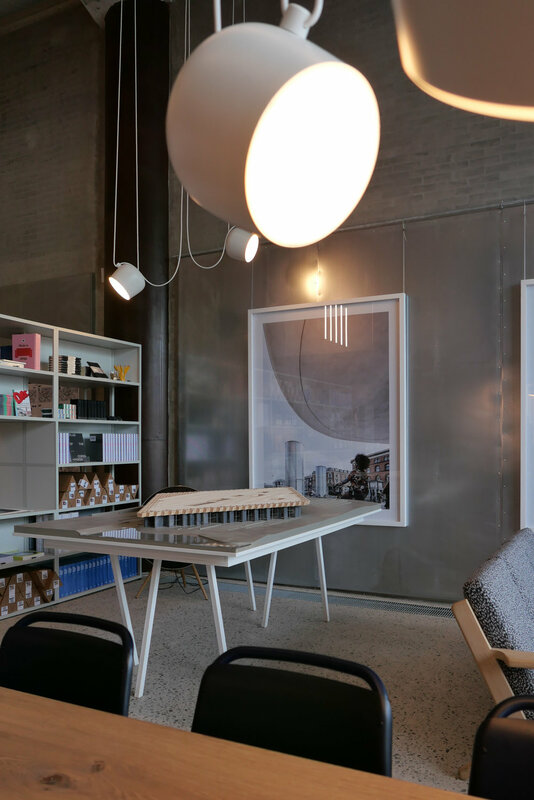 There is a long communal table and also low seating and Cobe show models and photographs of their work around the space and there is a carefully-selected range of books and design items for sale. 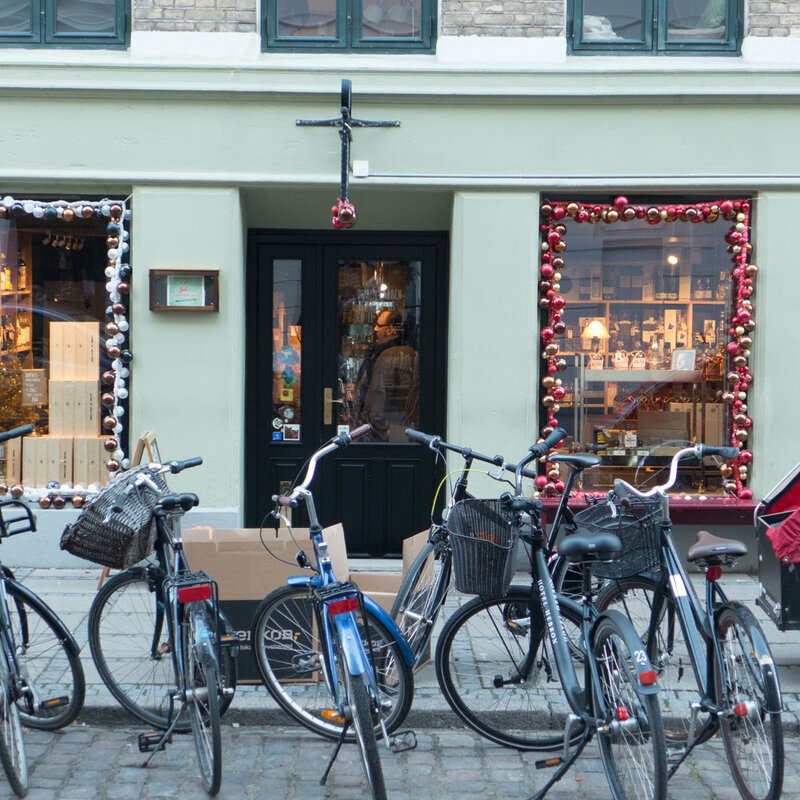 In the middle of December The Guardian newspaper published an article that listed ten "cool shopping districts around the world". These were "readers tips" so not exactly a methodical survey but nevertheless interesting. 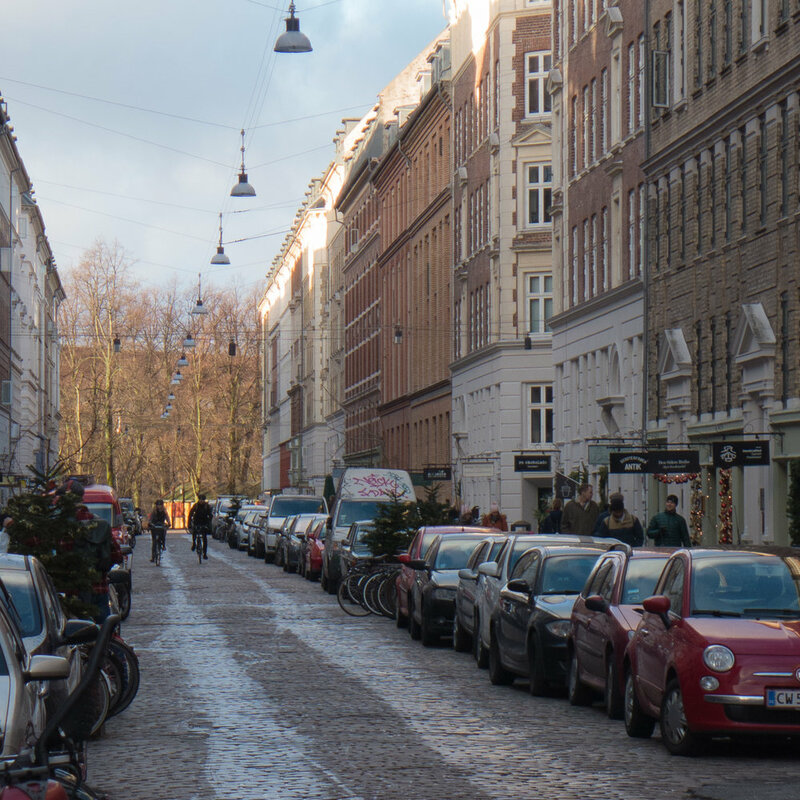 Included in the list was Jægersborggade in Copenhagen. 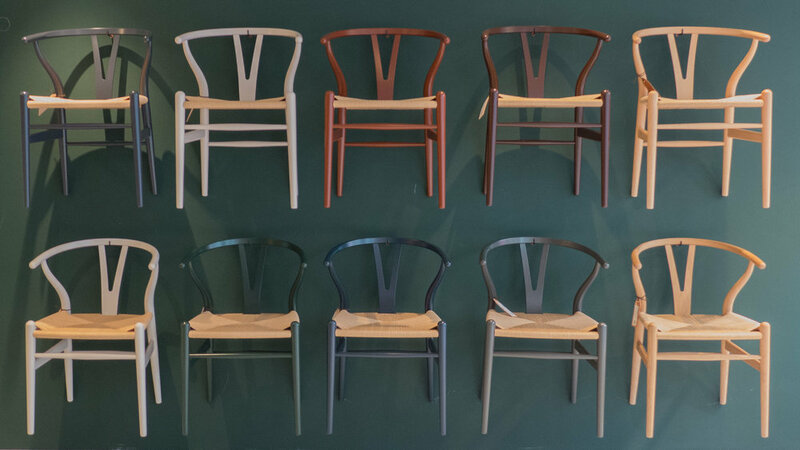 Carl Hansen & Son was founded 110 years ago and to mark their anniversary the company has released the Wishbone Chair by Hans Wegner in a range of eight new colours with Navy Blue, Russet Red, Deep Olive, Rosy Blush, Deep Burgundy, Oyster Gray, Forest Green, Midnight Blue and all with a semi-matt sheen finish. This is one obvious way to give this classic design ongoing appeal and relevance for another generation of customers but it also shows just how important not just the colour but the exact tone or depth of colour, and the finish is in making a design look fashionable and appropriate for a modern interior. 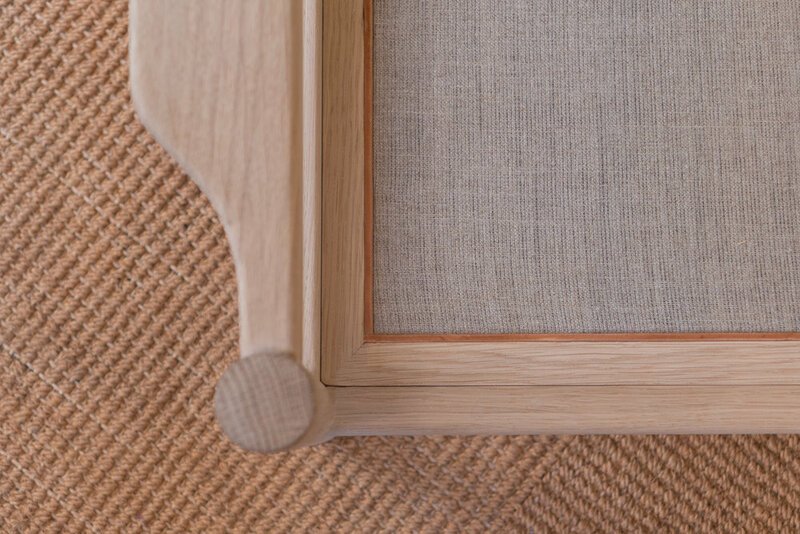 As one single factor, colour seems to be more important than the form and the details of the piece and even, curiously, more significant than any perception we may have of the date of the piece or any gut feeling we may have of the style of a piece of furniture. How do design teams select a very specific range of colours like this? Is there really a zeitgeist - colours that somehow we recognise as 'of this moment' or, being by inclination sceptical, is this marketing and advertising driven? Some time ago I saw a photograph of a Wishbone Chair in matt black with the paper-cord seat in black and set against a wall painted with matt blackboard paint with a floor of wide and very pale unvarnished boards and I thought how incredibly elegant and how sophisticated it looked. I see a Wishbone Chair in a high-gloss, bright blue paint and my first reaction is that it might be good in a large kitchen but I'm not sure I like it even though it is exactly the same chair. How can our reactions be so strong and so instant and, apparently, based on colours alone? 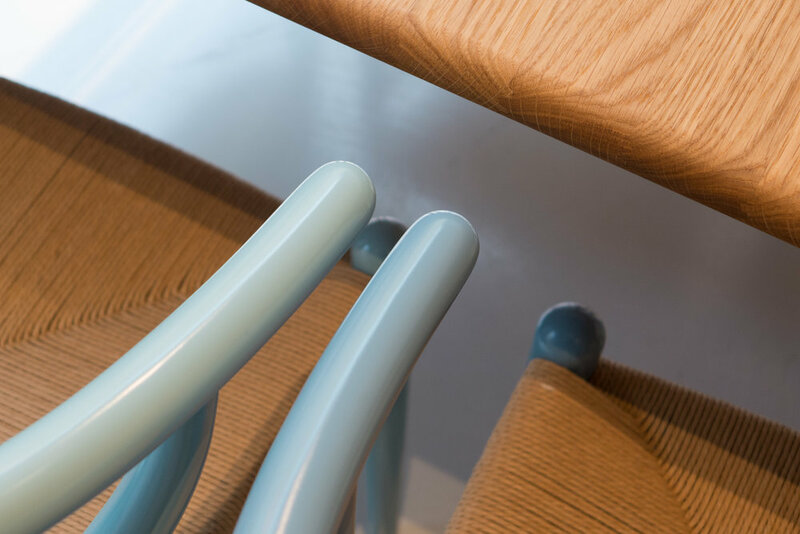 The Wishbone Chairs in these new anniversary colours are available until 31 December 2018. 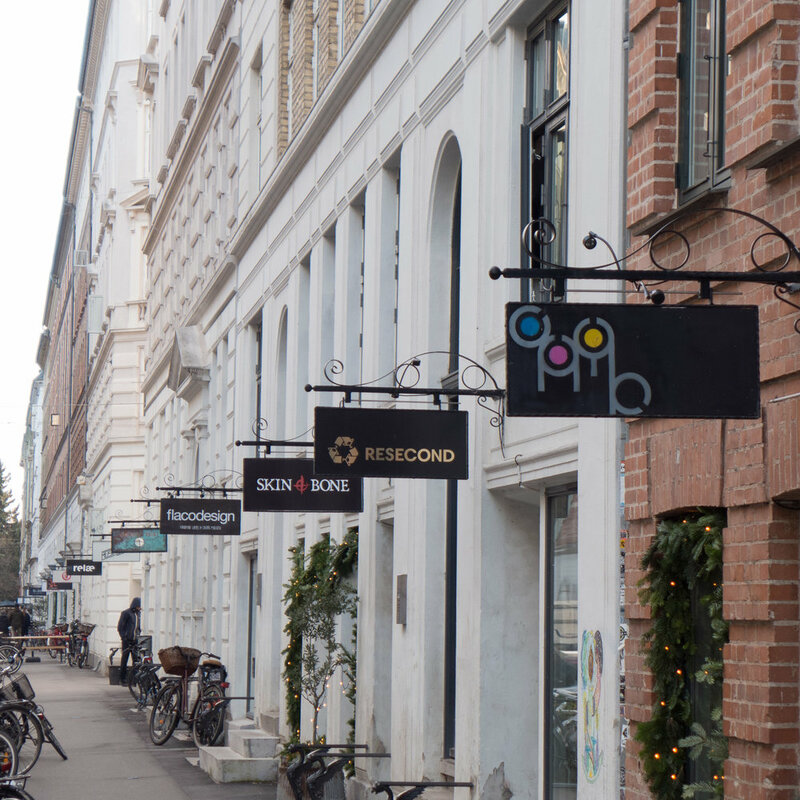 The paint range from File Under Pop was photographed in the Stilleben shop on Fredeiksborggade in Copenhagen - close to the Israels Plads food halls. 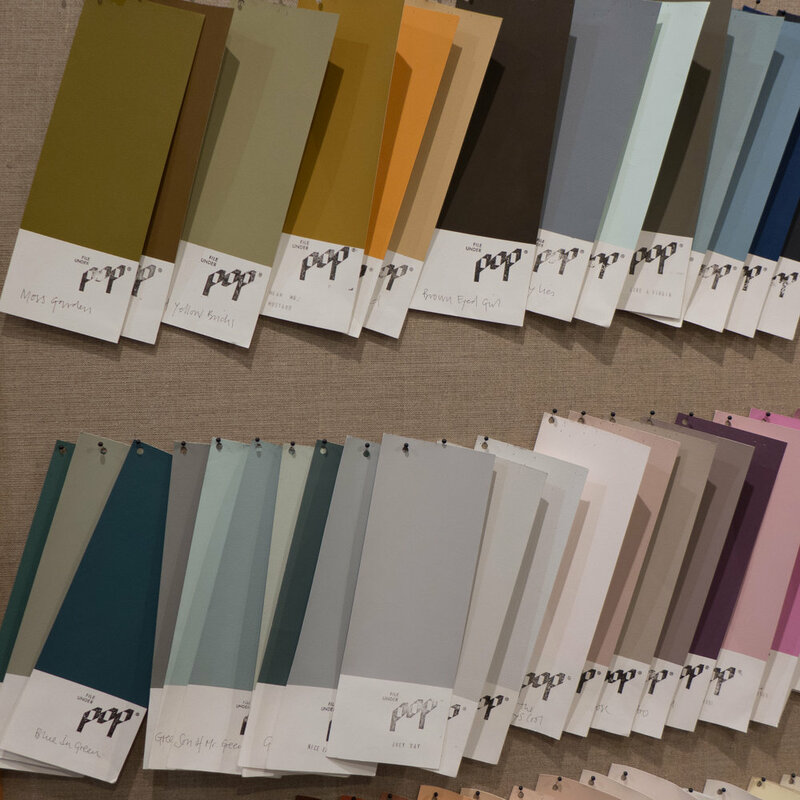 There are 64 colours in different finishes of gloss from a matt with 1% gloss for walls through to oil paint for wooden floors with 5% or 40% gloss and an 80% gloss for interior woodwork. The paints are produced with Jotun - the paint company founded in Norway in the 1920s. 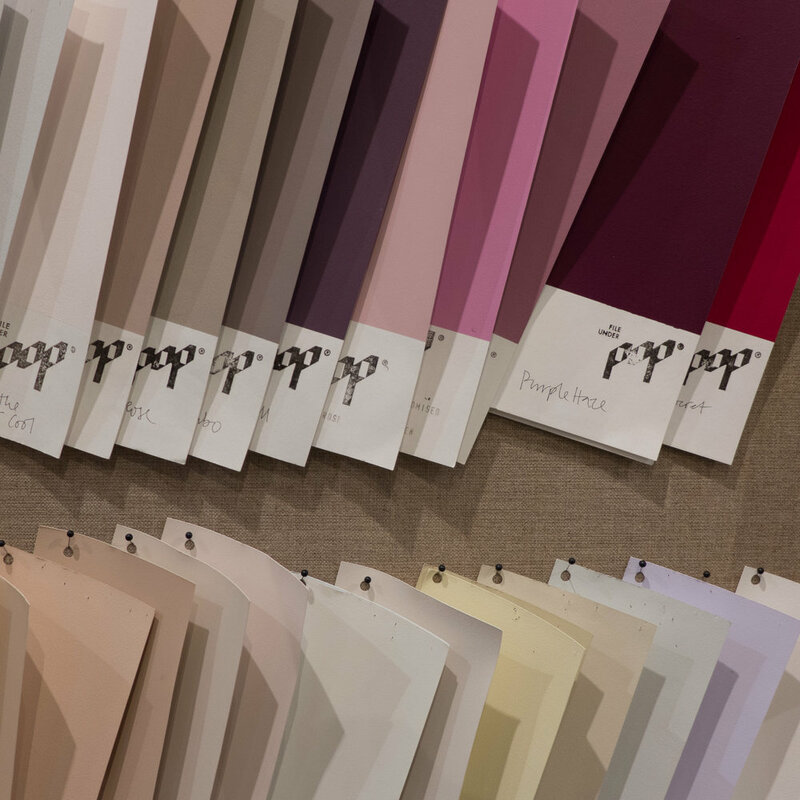 The selection and range of colours is interesting as is the way they are presented as large swatches pinned up as if they are a mood board. 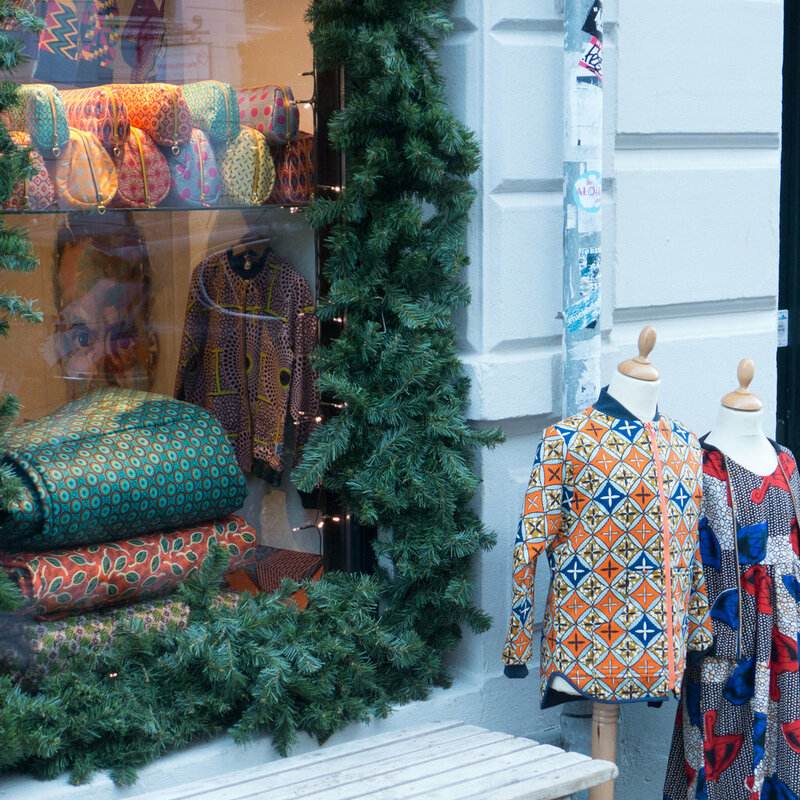 File Under Pop have their studio in Frederiksgade in Copenhagen - close to the Marble Church - and they specialise in tiles and wallpapers in strong colours. The tiles are made in Valencia and the wallpaper produced in Copenhagen. 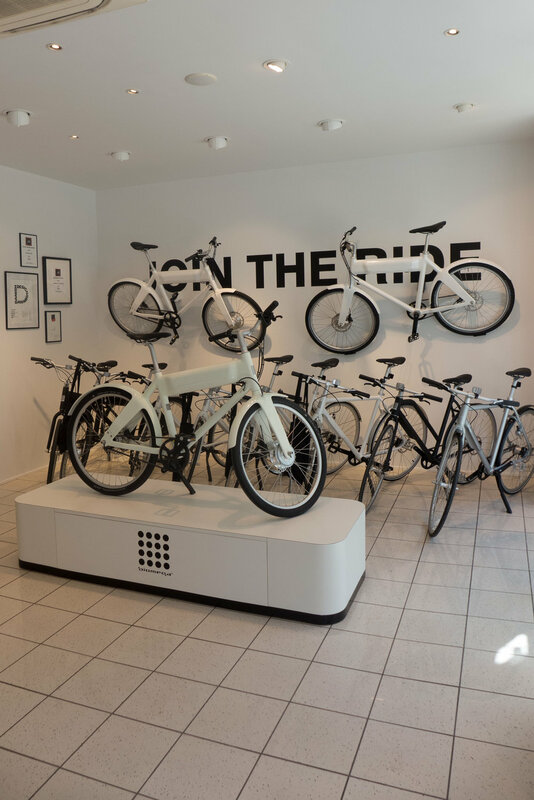 Biomega - the Danish bike company - have moved their store out of the city centre and they are now at Østerbrogade 78 so out north of the north end of the lakes and just beyond Trianglen. 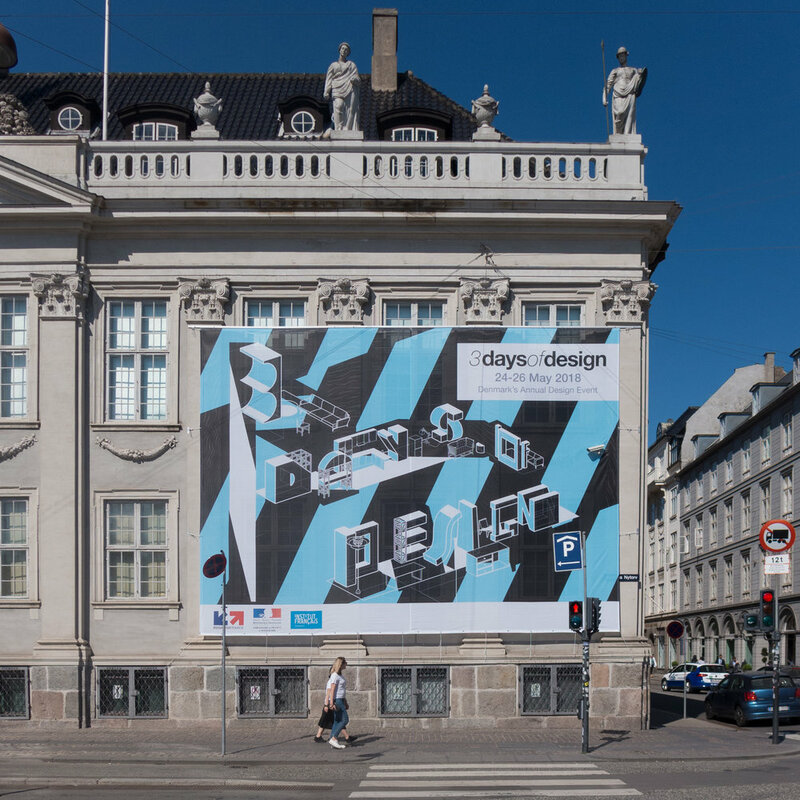 3daysofdesign in Copenhagen is now a massive event where design companies, design stores and many of the manufacturers open their doors to show what the city does in the world of design. It's an opportunity to launch new designs or new versions of classic designs or to launch new companies or celebrate significant anniversaries. There are events at Designmuseum Danmark and at other galleries and museums through the city and workshops and demonstrations are common but it is also a major chance for designers and makers and companies to socialise … it comes after the pressure of the big furniture fairs of Stockholm and Milan and really is a key point on the calendar to mark the start of summer. 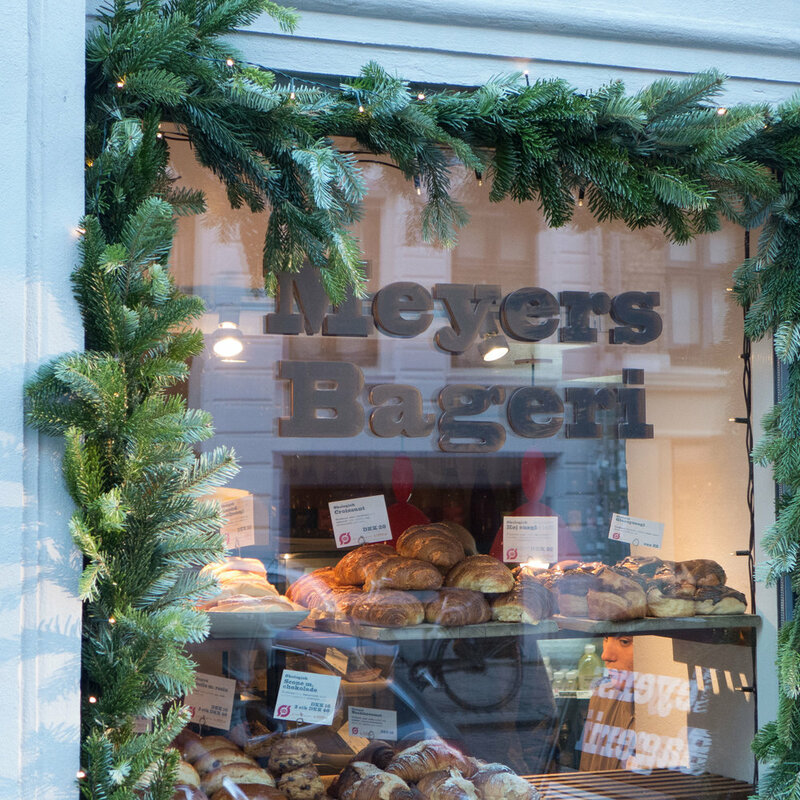 This year there were some 90 venues across the whole city and even a cyclists, powering around the streets, would be hard-pressed to get to everything at the right time in the right sequence. So the following posts are not the highlights but my highlights from the three days. 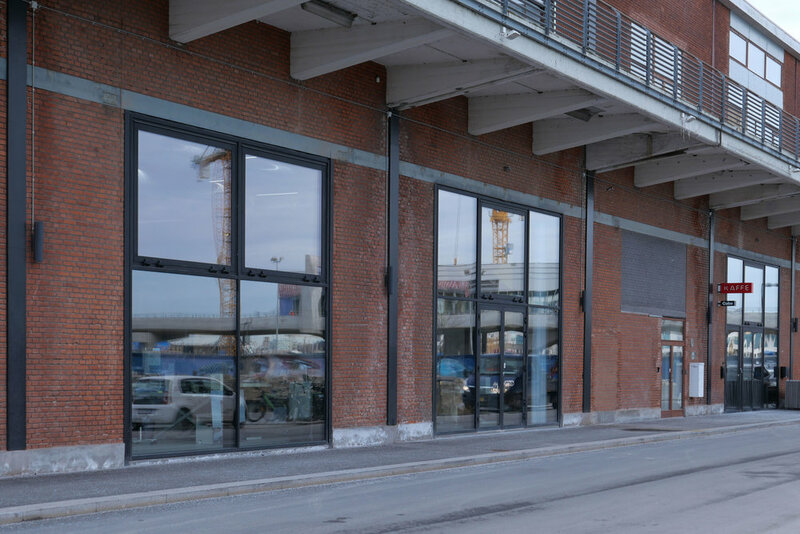 Design Werck, on the canal at Krudtløbsvej, showed the work of the forty or so companies that now use the gallery as their base in Copenhagen and with many of the designers and makers there to talk about their work. There were special demonstrations … for instance an afternoon of smocking … but above all it was an opportunity to meet and chat … the design community here were entertaining friends and family and all and any visitor that dropped by and wanted to discover or understand more about what was designed or made. 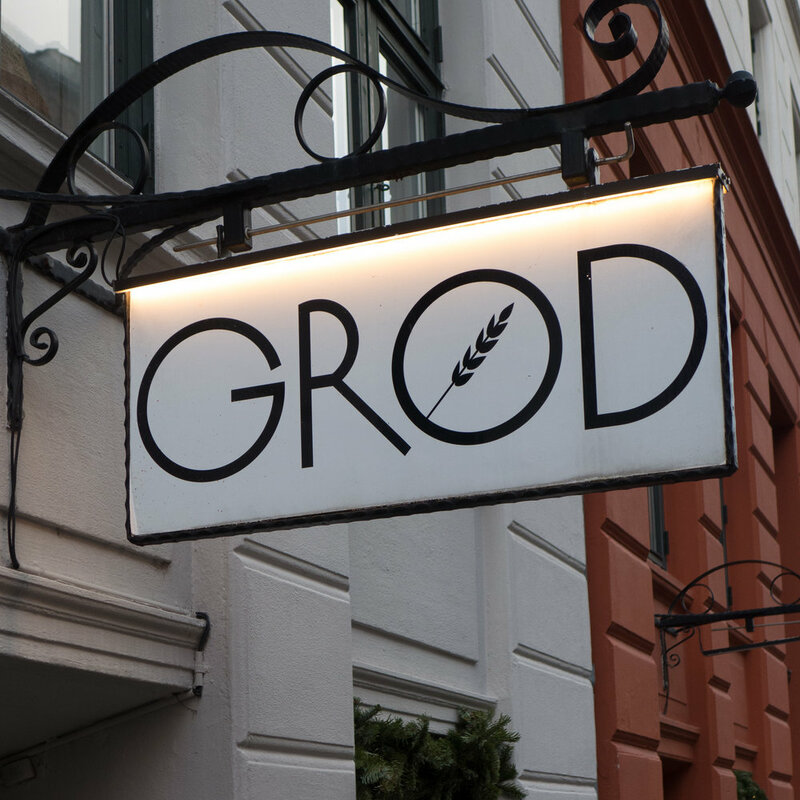 Food here was Danish and served out from breakfast and onwards but given a good west-coast sense with Henry Seymour serving out amazing oysters for a Danish brunch and there was gin and tonic each evening. The main display, specifically for 3daysofdesign, was organised in conjunction with Business Finland to show the furniture and products of designers and companies from Finland. The north end of the gallery was cleared and then restyled as a Finnish cottage with the furniture, lighting, textiles and wallpaper and so on shown in a more-obviously domestic context. 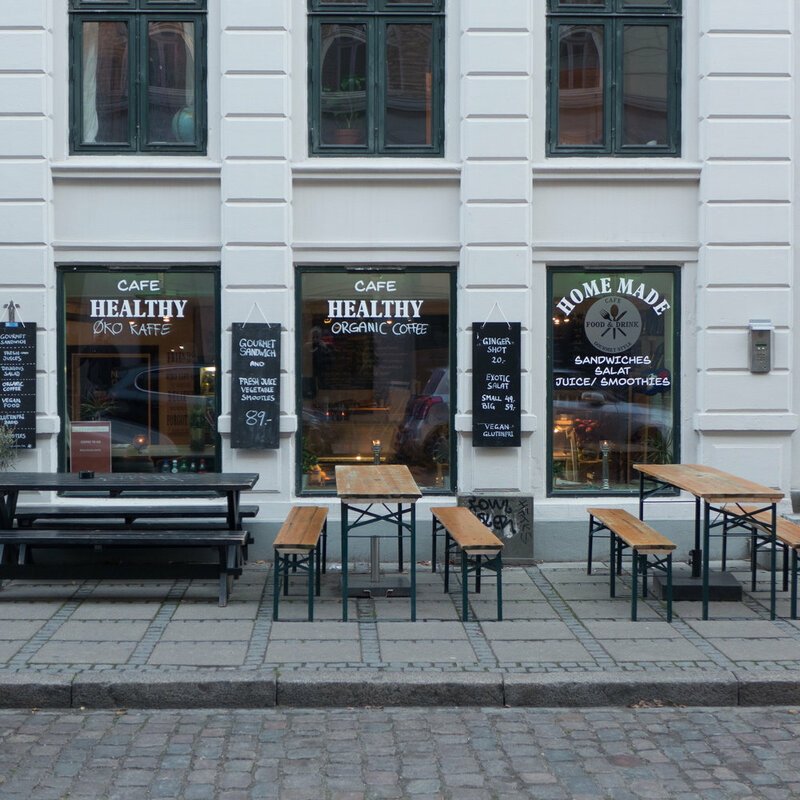 This independent furniture shop on Store Kongensgade actually shares a courtyard with Frederiksgade 1 - see below. They sell a good and carefully-chosen range of modern furniture and rugs and lamps and so on. For 3daysofdesign they clear much of the ground-floor showroom for companies to show specific ranges or specific pieces. This year there were two companies in particular that stood out for highlighting two very important ideas that have to be considered now if Danish design and Danish furniture production are to thrive actually in the country together … not about Danish design as a concept or as a style but Danish design and Danish manufacture thriving and moving forward together in Denmark. Anton Assaad was there to represent the company Great Dane that he established in Melbourne in Australia in 2002. 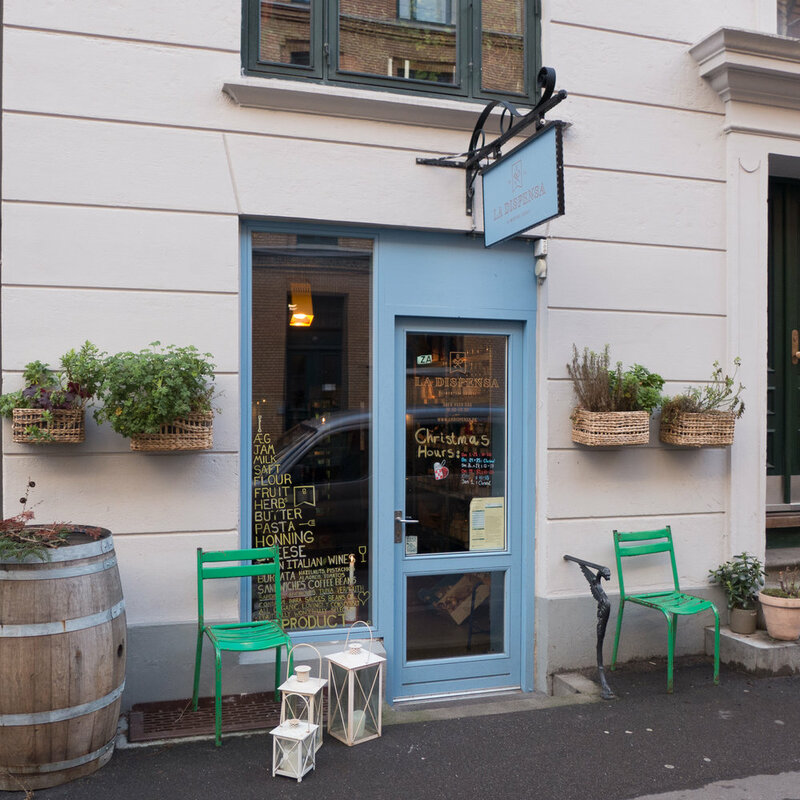 His store sells top of the range Danish furniture including cabinets by Kai Kristiansen and the large leather-covered armchair V11 by Illum Wikkelsø that are made in Denmark. The key to his business formulae seems to be identifying and appreciating major designs that are no longer in production and then, working with the families or the old companies, he gains licences to restart production to a very very high standard with quality being the paramount consideration. At almost the opposite end of the commercial spectrum were two cabinetmakers who are together Risskov Møbelsnedkeri. 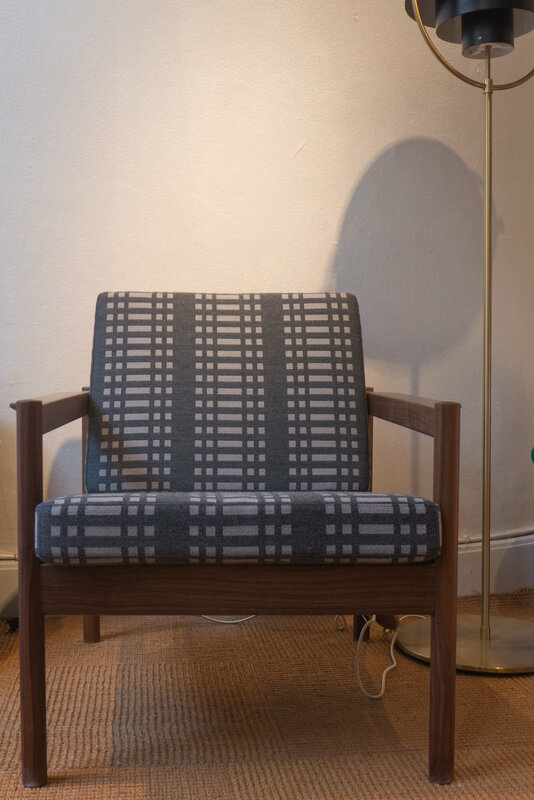 They showed furniture designed and made by them but the main design for 3daysofdesign was their arm chair also designed by Kai Kristiansen in the 1960s so again a classic chair. This is a typical form of chair that was relatively common in the catalogues of several manufacturers through the 60s with a simple frame of wood with wooden arms and with simple square cushions for the seat and back. France & Son produced several variations by Ole Wanscher and Illum Wikkeslsø designed Lænestol Nr 4 in 1959 and Poul Volther designed Model 390 in 1961. This particular design by Kai Kristiansen is very close to what we had at home when I was a kid and my parents called 'contemporary' design. The important thing here is the quality of the work and the appropriate technical changes that have been made by Risskov Møbelsnedkeri to bring the chair up to date … so the thin coated wire springs under tension that formed the support of the seat cushion in the original chairs have been replaced with taut material that does not stretch and where the original chair was shipped as a flatpack that, to some extent, compromised the strength of the frame, these chairs are completely assembled and finished in the workshop. 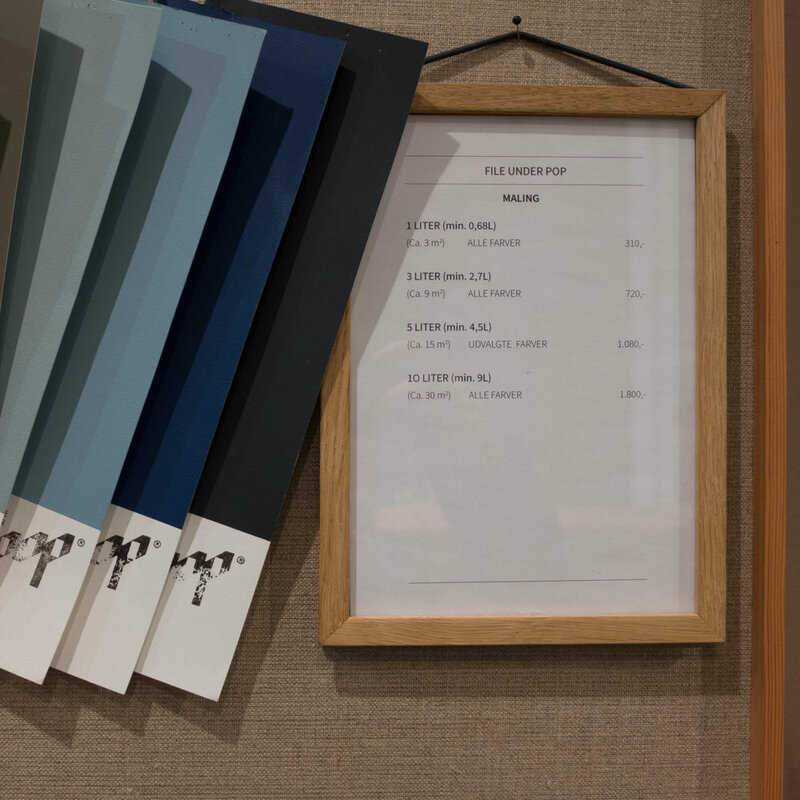 The materials for the upholstery is quite-rightly from Kvadrat. 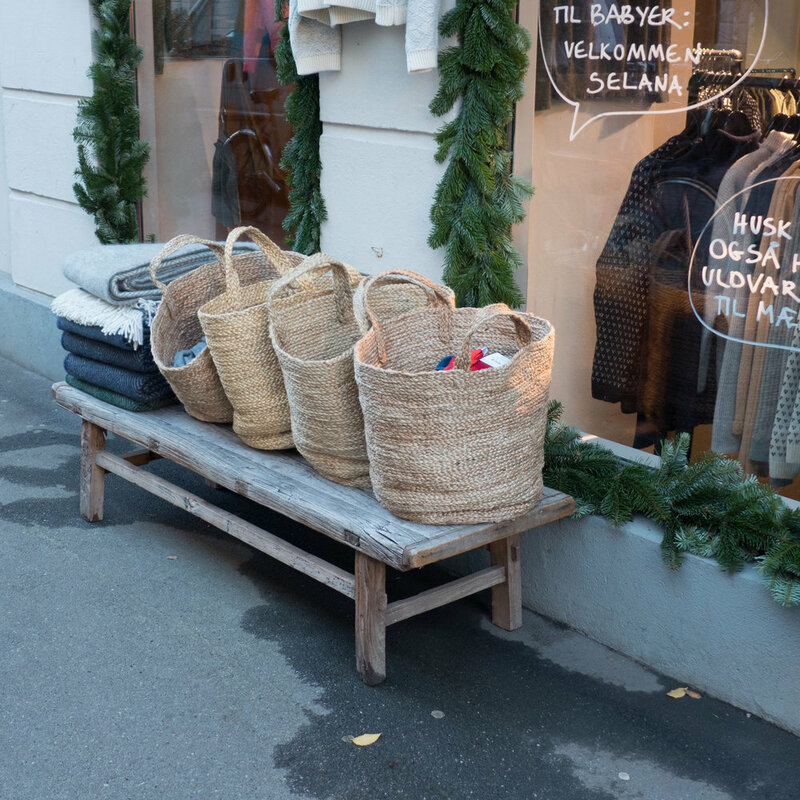 Design stores throughout the city put on special events for 3daysofdesign but Normann can always be relied on to have dramatic displays in their store in Østerbro. For this year, the sharp pinks of last year have gone and for now the huge space of the main part of the store has been subdivided by massive grey curtains that drop the full height and form spaces for room-like displays but with mirrors and large bold stacks of blocks to display chairs and the effect is certainly theatrical. The company took this opportunity - the events of 3daysofdesign - to launch their new Tivoli Collection. 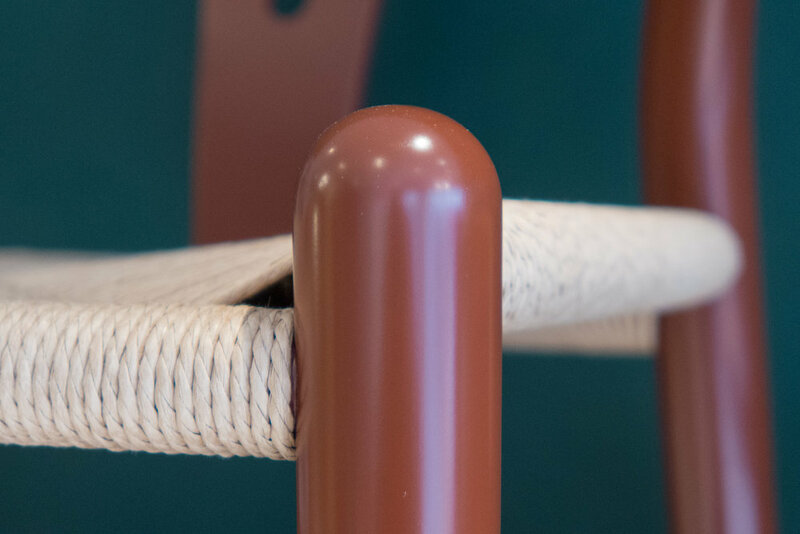 The most obvious pieces are a new take on traditional Danish wooden toys in bold colours but, more significant, is a new co-ordinated range of home accessories all taking as a starting point the inspiration of the pleasure gardens of Tivoli in Copenhagen. The launch was during 3daysofdesign but the full range will be available from the Autumn so ready for the build up to Christmas. This is certainly an interesting development. Most furniture and design companies produce ranges of objects from novelty tableware to candleholders to purely decorative ornaments that supplement the main range of furniture and the more practical but often unexciting ranges of basic and practical household items like plates or bowls or flatware and if you know your design world you can spot what are obviously company colours or typical shapes or even predictable materials but here, with the Tivoli Collection, there is a very deliberate rethink of over 300 pieces to create coherence … so much so that Normann themselves are talking about the Tivoli Brand. From the start, Normann were noted for the colours they used, usually on bold deliberately simple and uncluttered shapes for their furniture, and they were one of the first companies to mark a clear rejection of the more conservative Danish colour palette of the late 20th century and the first decade of this century … so they replaced pale natural colours with strong and deep colours for fabrics. Maybe, with the Tivoli Collection - with the use of much more decoration and the use of gold and so on - Normann are again heading a different move away from the stripped back and uncluttered rooms normally associated with Scandinavian homes to something that many will feel reflects more complicated and more individual lives. To me it seems a bit like a return to the days of Biba in London and the very first collections of Habitat … not the simple designs from Scandinavia and Germany that Conran introduced to British homes but the Moroccan rugs, the rope plant holders, candles and brass watering cans that filled his stores and pulled people in. Essentially, looking at that change as a social historian, it was all about a break away from post-war austerity … about individuality and about young adults wanting to buy things that were interesting and hinted at excitement and travel and a broader more open viewpoint …so perhaps the more ornate accessories from Normann mark that point where cool and rational Scandinavian design seemed too much or, rather, too little for getting away from austerity economics. 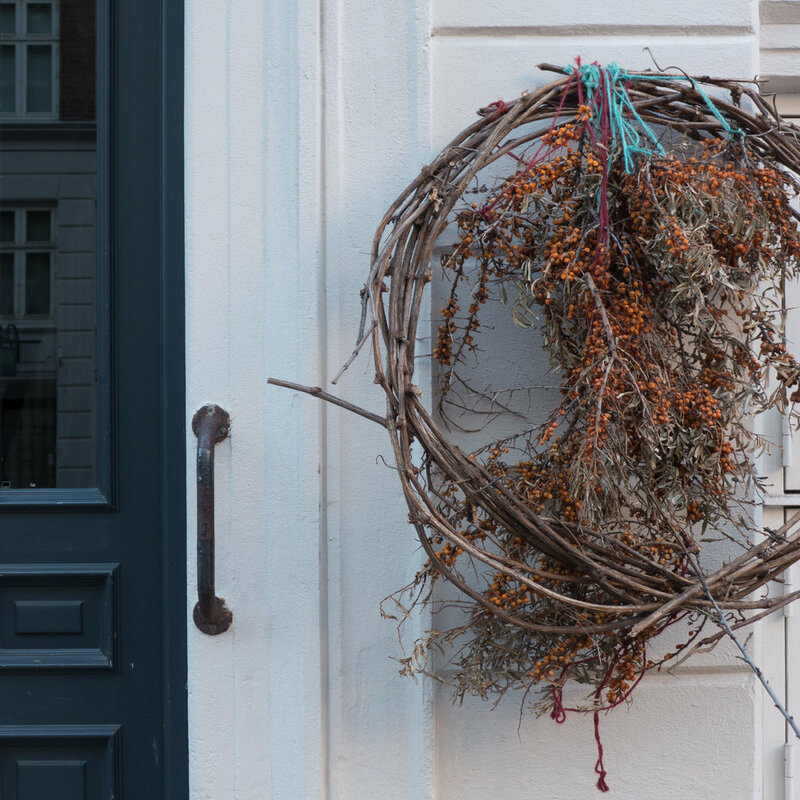 Skandinavisk - the people who make scented candles and diffusers and, more recently, a range of perfume oils, soaps and hand creams - have opened a pop up shop in Værnedamsvej in Copenhagen and they will be open until 26th April. Although this is a short-term venture, a huge amount of work and care has gone into the design of the space from the customised front window - matching the graphics of their cotton carrier bags - through to the pine display shelving and the use of greenery. They have produced Voices ... a magazine to explain the company ethos … with images and interviews reminiscent of life-style magazines like Cereal. That is certainly not a bad thing … just a very good way to explain their approach. There are interviews with an editor; a photographer; a food stylist and a publisher - one with photographs of her home on one of the smaller Danish islands; one with her home in a Swedish forest; one who grew up in a small community on a fjord outside Oslo and - to complete the Nordic set - the publisher is from Helsinki. So it really is about telling the story of how life in the Nordic countries has inspired the scents Skandinavisk have created. With this web site I try to tread a distinct path - away from the life-style blogs - but that does not mean that I do not appreciate a story because that’s the way to understand the what and the why and the how. Certainly what is clear is that, as so often in Denmark, behind the products and the beautiful design is a huge amount of thought and that covers not just what is produced and how it is made but how it is presented and so much depends on the details ... for Danes the over-riding principle with design is if you do something then you do it properly … so here the glass and ceramic candle holders have wood lids; for the white ceramic candle holders the design is raised; the names of each scent are chosen to reflect the mood to describe the mood that scent evokes and, of course, simple but pitch-perfect photographs and graphics. It has just been announced that the Danish design company Muuto has been purchased by the well-known American furniture manufacturer Knoll. Last night there was a party at Design Werck to celebrate the anniversary of the opening of the gallery two years ago. It was well attended by friends and by many of the designers and companies represented by the gallery … it might not look it in the photograph but then the food and drink was exceptionally good and it was interesting to see that very few people wanted to move away from the kitchen at the other end of the gallery ... even when Birgitte Bjerregaard and Ib Schifter Schou spoke about setting up the gallery and thanked everyone. Part of Sunday afternoon was spent looking at the new ARKET store in the old post office building in Købmagergade in Copenhagen so it really was a bit of a fashion day with the time looking at the photographs from Danske magazine on Højbro Plads. ARKET - a new brand from the Swedish company H&M - opened at the beginning of September so just a week after their first store opened in Regent Street in London and ahead of Brussels and Munich. One style magazine suggested the brand sits between & Other Stories and COS but I'm not sure exactly what that means although I could understand the point that the magazine went on to make that this is a brand for good-quality basics. Over the last year or so in Copenhagen I have been to a couple of seminars or discussion sessions where some in the design world here have suggested that furniture and design companies could follow the example of the fashion industry by introducing a stronger sense of a "new season" for designs and move forward with more peripatetic designers and even more manufacture outside the country to keep prices down and give the marketing of design a stronger sense of momentum ... a stronger sense of novelty that the fashion industry has mastered so people should want to want to buy ... to stimulate sales. It is the second sentence that is important. Could this actually be a major fashion company moving the other way - moving towards the marketing ethos of the best Scandinavian furniture and design companies who promote investment in quality rather than a relentless drive to create and then satisfy a customers desire for novelty? Certainly it was interesting to see that the men's section does include cashmere jumpers and the jackets for their suits have proper buttonholes on the sleeve cuffs which shows that they really understand both the rules and the traditions of proper tailoring. 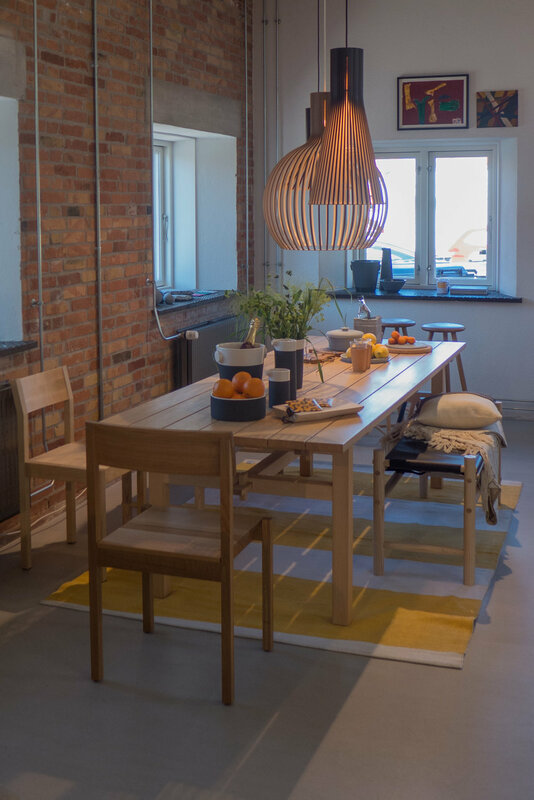 Shop fittings included the classic Artek Stool 60 by Alvar Aalto and the home section has the Sarpaneva Pot so both the store designers and the company buyers have a clear sense of Nordic design heritage. The home section was good … it would actually be interesting to know who their buyer or director of home sales is because they have chosen well and it will be fascinating to see how the home section develops. Again, as with the clothes, these are good basics. And what was also interesting was that the selection of items had a different look and character that is distinct from homeware sold in the H&M stores. At ARKET they have glass jugs with a pouring lip but straight sided, like a chemistry laboratory beaker, and a similar style of straight-sided jugs and mixing bowls in white china and there is an interesting range of enamelled cookware from Hario; glassware from Duralex and some good plain cushion covers; some simple linen and a range of those Swedish brushes by Iris Hantverk made in workshops for visually impaired workers. For someone moving into their first unfurnished place then they could make this the first stop for … here's that word again … basics ... the good quality items that would be a good investment. Back to general points - the historic building seems to have been restored and converted well, with a muted colour scheme of stone and grey. Packaging for underwear and so on was in plain, unbleached cardboard and the café sold fresh coffee and olive oil and other foodie things that were, again, in well-designed simple packaging … hardly revolutionary but never-the-less good to see. The café was comfortable with well-priced coffee and some fantastic cardamom biscuits so, all in all, a good afternoon. This Friday - 18th August - is Bredgade Open. 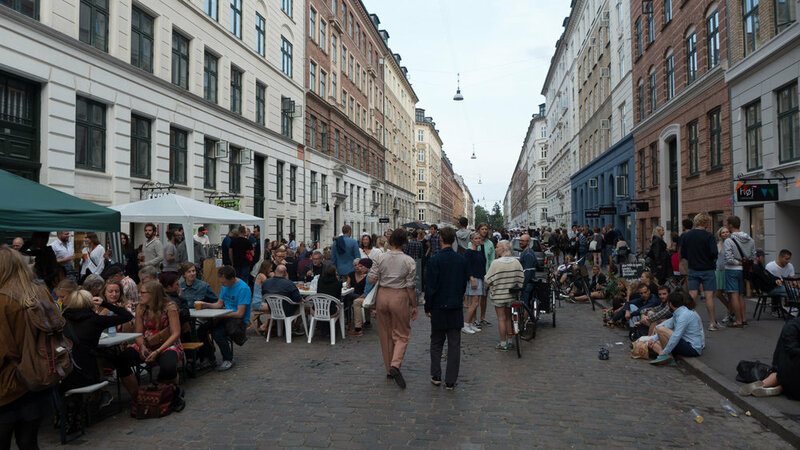 Now a well-established annual event when the galleries, museums and design stores along Bredgade in Copenhagen have open house. It’s a good opportunity to meet people, ask questions, see displays that have been set up for the afternoon and evening and there will be food stalls, drinks and music. The impressive post building at Øster Allé - on the corner of Fælledparken and close to the football stadium - was designed by Thorvald Jørgensen and was completed in 1922. It has been converted into a museum of post and telecommunications. 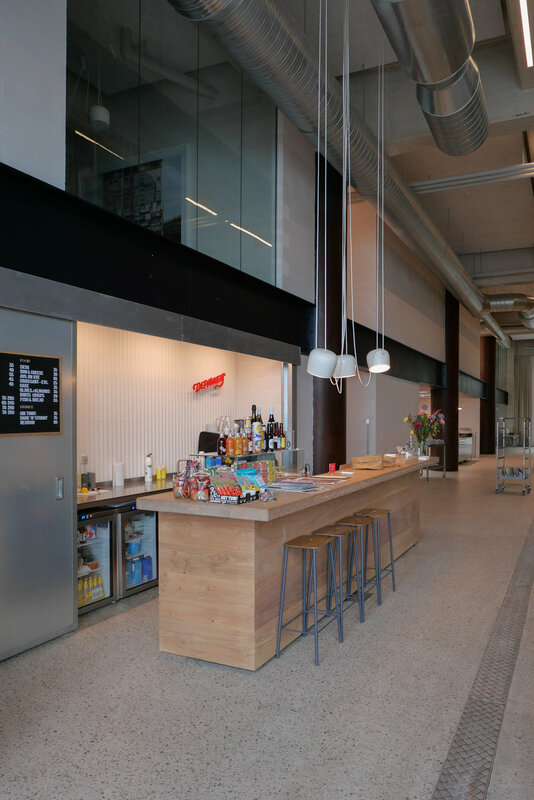 There is still a proper post office counter just inside the main entrance although most of the ground floor is now a spacious and pleasant cafe - Enigma Kantina - with long tables where you are encouraged to talk to other people. 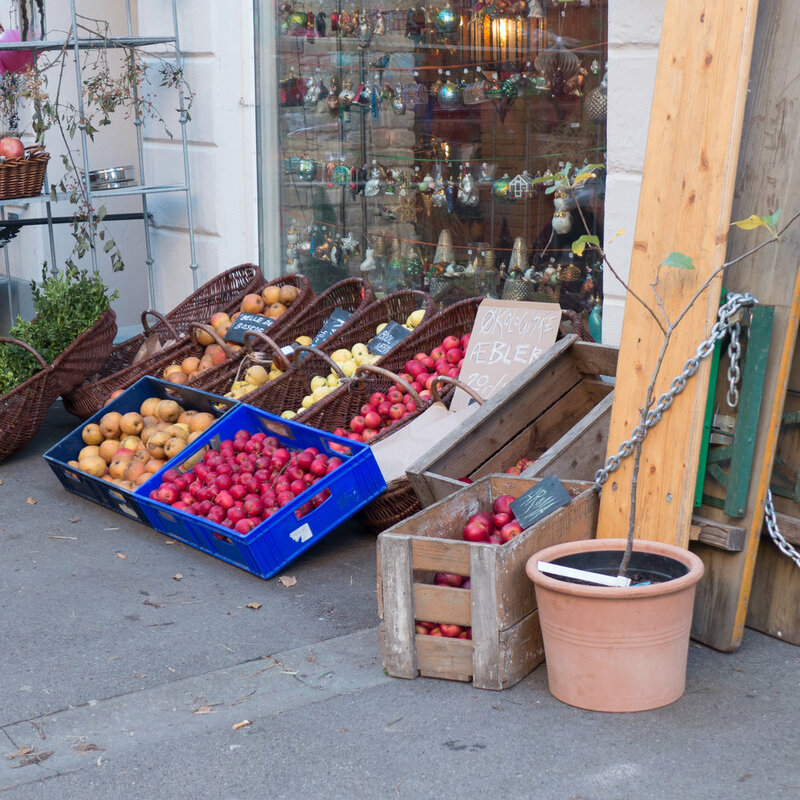 They also sell gifts and smaller design items as well as souvenirs related to postal services and there is a sunny courtyard to the side - presumably the yard where postal vans loaded and unloaded. The square in front of the building has been almost completely taken over by construction works for one of the new Metro Stations so it will be interesting to watch how this area changes and develops over the next few years once the extension to the metro is finished and the station opens in 2018. Discovering Spaces has been the most recent exhibition or reorganisation at Normann Copenhagen. In the long steel-lined entrance hall is a display of their chairs in some of the many possible configurations that can be chosen and then the large main ground-floor space beyond is now divided by tall blocks in strong colours and lengths of clear ‘butchers’ curtains that create a series of tightly-linked spaces and provide drama for the arrangement of their furniture and the clothing that is sold in the store. The far high end wall of the space is now boldly striped in dark colours and lengths of carpet that continue down and across the floor. Velvet-covered pouffs in the lower very pink gallery space are set in groups across the floor and across the ceiling and fixed to the walls … probably not an idea to try at home but actually what the display in the store does show is that blocking diagonal views, changing lighting from one space to another and breaking up space all add drama. Is this designers suggesting a move away from the New York loft look of large expanses of floor in concrete or wide boards … preferably distressed. Maybe it’s because the Normann show room is in what was an old cinema or maybe it was the dramatic relaunch of the space last year but the glamour does seem to suggest that the inspiration might be less International Modern and more Art Deco. The brothers Mogens and Flemming Lassen were born at the beginning of the 20th century. They were contemporaries and friends of Arne Jacobsen - the three were at school together - and all three went on to be architects and furniture designers becoming well-established by the early 1930s. Flemming Lassen and Jacobsen worked together to design Søllerød Town Hall and its furniture and fittings completed in 1942. 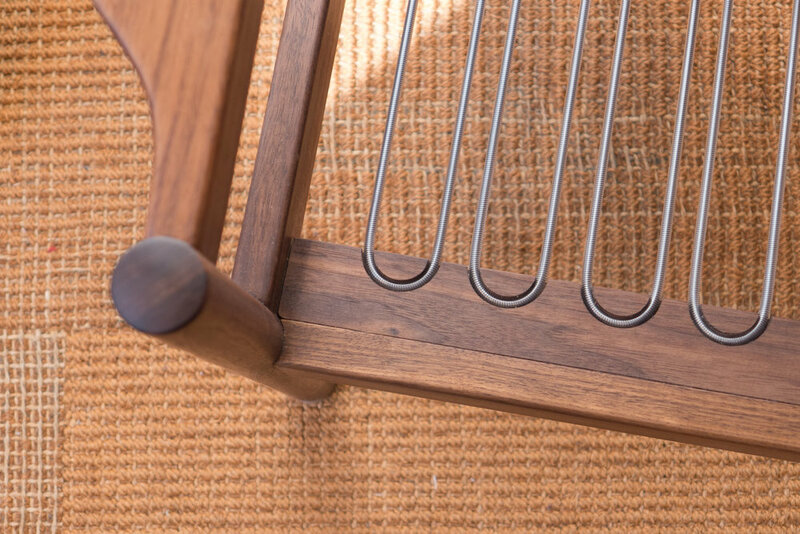 The company By Lassen was formed by younger generations of the family to continue the production of designs by Mogens and Flemming Lassen. For 3daysofdesign their store in Holbersgade in Copenhagen had special displays for visitors with the main level just up from the street laid out as an apartment furnished with designs from the collection and at the lower level - a few steps down from the street - Mogens Lassen’s work room and desk had been recreated with historic photographs, original possessions and early and trial versions of production pieces that are still owned by the family. There were also architectural drawings and historic photographs of buildings designed by the Lassens - again from the family collection of archive material.